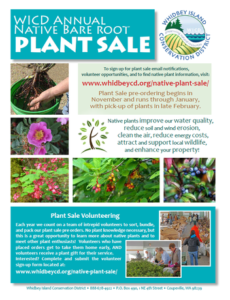 The Whidbey Island Conservation District is having their Native Plant Sale starting in November. The pre-order period is from November until January. They recommend pre-ordering as early as possible for the best availability. They have fantastic values on native plants and your purchase supports this great organisation.